This device SAVED 12 lives in 2017 in Australia (recorded) and many more that were not recorded! Make no mistake about it ... this is a LIFE-SAVING DEVICE !! Other products use pressure to measure the depth of the CPR compression. This device uses impedance to check the blood flow. And it only takes 3 minutes before lack of oxygen/blood flow to the brain starts causing brain damage. It is the blood flow that you must be able to measure and adjust your depth of compression to ensure it carries the oxygen to the brain. The HEARTSINE Samaritan 500P gives “Clinical Empowerment to the Ordinary Rescurer”. 4. Early Advanced Care – (i.e. the victim needs to receive hospitalisation). 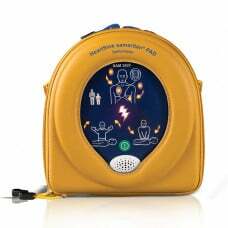 Investing in an AED is a great step forward because it can increase the chance of survival for witnessed Cardiac Arrest from 5% to 85% - when combined with the other links in the chain of survival. But most models on the market will leave you vulnerable on your ability to ensure good CPR. Even AED's that claim to have CPR feedback technology does not have the ability to determine the effectiveness of your compressions - they simply are basing the feedback on how hard you are pushing. Now, unfortunately, there is a huge difference from individual to individual, inappropriate force and pressure required to perform effective compressions. At this point, the rescuer will be instructed to perform CPR. Poor quality compressions will not effectively distribute the blood to these vital organs, and they begin to fail quickly. And about 70% of all CPR is ineffectively performed. The HeartSine Samaritan 500P contains technology that determines electrically through the defibrillation pads, whether your compressions are in fact effective.